Died: 7th June 1916; KiA. 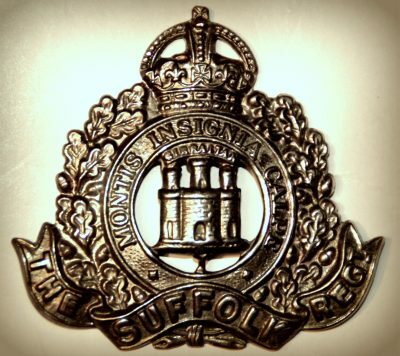 Enlistment Details: Location: Ipswich; Date: 10th November 1914; Occupation: employed by Ransome, Sims & Jefferies. Date of Entry Therein: 1st June 1915. 1891 25, Dillwyn Street, Ipswich. Alfred was 8 years old and living with his parents & sisters. Alfred James Barker, 41, a Hotel Waiter, born Norwich, Norfolk. Mary Ann Barker (nee Smith), 36, born Norwich, Norfolk. Minnie Elsie Barker, 2, born Ipswich. Gertrude Edith Barker, 1, born Ipswich – 1892, Ipswich. 1901 114, Handford Road, Ipswich. Alfred was 18 years old, an Iron Moulder. He was living with his widowed mother & siblings. Mary, 34, a Laundress – own account. George Arthur Barker, 6, born Ipswich – 1907, Ipswich. 1911 114, Handford Road, Ipswich. Alfred was 28 years old, a Window Cleaner – own accout. He was living with his mother. Gladys Agnes Elsie Barker, born July 1914, Suffolk. Lille Doris Barker, born August 1915, Ipswich. Alfred is remembered on the war memorial at St. Matthew’s Church war memorial.